A lovely Kenyan from Evocation Coffee in Amarillo, TX. This coffee is- BALANCED - JUICY - CHOCOLATEY. Rich in aromas, we smell dried fruit, caramel and dark chocolate. Its body is full, round and juicy, laced with apricot, sweet oranges and grapes. 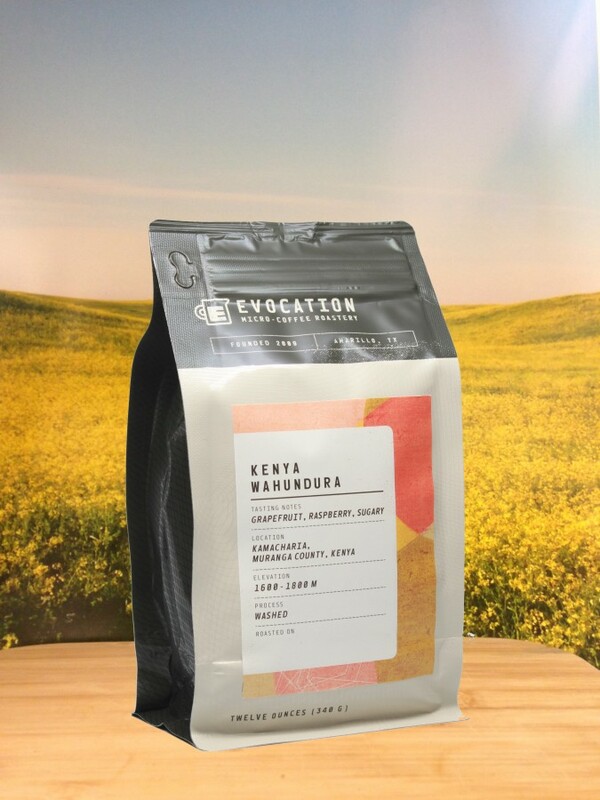 Soft notes of vanilla and light brown sugar deepen into molasses and dark caramel as tastes of spice and cacao define the lower complex tones of this coffee. The linger is rich and sweet, hanging on pleasantly like cola and smoky dark chocolate. Chocolate and caramel entice in the nose as the first sips coat the mouth with a juicy round body. Fruity and sweet, the acidity that glows in the cheeks a bit. Balancing this is a candy-like sweetness, clean and pervasive. Low tones of black tea and chocolate complete the experience. The aftertaste has a long, soft linger of tea tannins and dark caramel. This coffee is- Balanced - Juicy - Chocolatey. Evocation Coffee is in Amarillo, TX. We've been roasting for 7 years. Categories: Coffee Ratings. Origins: Kenya. Flavors: Apricot, Baking Spices, Black Tea, Brown Sugar, Caramel, Citrus, Cocoa, Dark Chocolate, Full, Juicy, Molasses, and Stone Fruit. Brew Descriptors: Balanced, Chocolatey, and Juicy. Roasters: Evocation Coffee.